The floating line is designed to float in or on top of the water surface. If it does not float it needs to be cleaned and dressed with line floatant. Most fly anglers do not pay attention to this detail. Fly line that is cleaned and buffed casts better and floats better and lasts longer than unloved ones. A clean line is easier to cast since it glides better in the rod guides. A floating line is made by putting air bubbles into the plastic, thus it has lesser density than water and floats on top of the surface. The floating line is the easiest line of them all to cast and should be the first line for all beginners. If we want to fish on the surface a floating line is our choice. It is possible to use longer leaders with a bead head and fish deeper. I recommend #6-8 weight-forward floating line for all beginners. 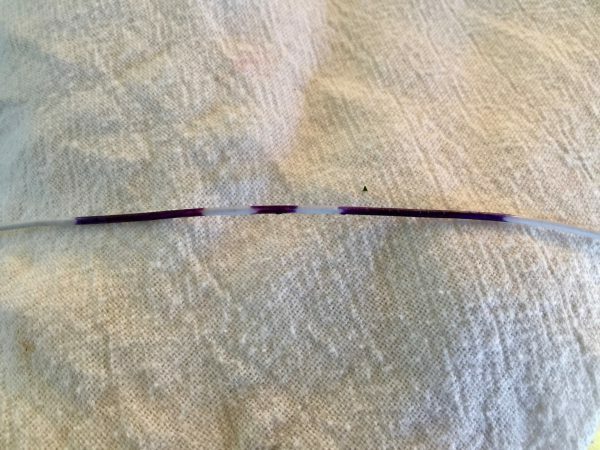 For beginners, it is a good idea to mark the end of the back taper with a felt pen (if a line is bicolored it is not necessary). Then do not keep this mark out of the tiptop. Beginners cannot carry much line in the air, and if they try to carry the running line it gets increasingly hard (overhang – the running line outside the tip top to the back taper). It is best for them to keep this mark close to the tiptop (no more than 2´ out) and shoot line instead (see casting). It is also educational and helpful to mark distance on your fly line, to be able to judge the casting progress. As you gain experience you just can feel the transition in the line thickness with your fingers. I mark all my lines with their # weight. Even though some come with a marking, it usually wears off. I use half an inch mark for 5 and then quarter mark for 1 (like the roman system). This system has proven to be very helpful for me because I have so many lines, so this helps me stay organized. I suggest that you keep the box your line came in, where much useful info is printed. The exact profile of the line is not always on the box but can be found on manufacturer’s websites.